I was a Campbell’s Soup Kid. Any time was soup time and I would have soup for breakfast, lunch and dinner. When I was little, I always had a thermos of Campbell’s with me, but that’s because I was always either at the ice rink or going to or from the ice rink. I didn’t regulate heat very well, (still don’t) so the fastest thing to help raise my core temperature was a steaming bowl of soup. My mom was a creature of habit, certain varieties were always served at certain times. Cream of mushroom was for early morning car rides to the rink. Chicken noodle with O’s was for after school sessions before I hit the ice. My favorite, Chicken with Stars, was usually saved for when I was sick. In high school, I continued to be Campbell’s crazy. I’d sneak away at lunch to a friend’s house to whip up a quick batch. We were really into the creams at that time; celery, asparagus, chicken, broccoli and of course mushroom all made with milk whisked with a fork. I travelled with this mug and would only eat my Campbell’s in it. Around that same time, I began going out with a guy that looked a lot like the kid on the right. I used to call him my “Campbell’s Soup Kid”. Not that he didn’t have the chubby cheeks of that kid, but when he saw my mug and what I was referring to, it wasn’t long before we were not going out anymore. Throughout my university residence years, my love affair with the red and white cans continued and I started to get “creative” with my soup. I sprinkled tomato soup liberally with Kraft parmesan for added texture and saltiness. I poured cream of mushroom soup onto microwaved potatoes. I had a boyfriend in 3rd year who loved tuna casserole with cream of broccoli soup and rippled chips crumbled on top. I had more than my fair share of tuna casserole, but thankfully as my relationship with him ended, so did my foray into casseroles. I still say I can eat soup every day, and I often do. And even though I always have a few cans of Campbell’s in my cupboard, I’ve graduated on to making my own from scratch. Most of my homemade soups take a fair bit of time to make and look nothing like anything I grew up eating. 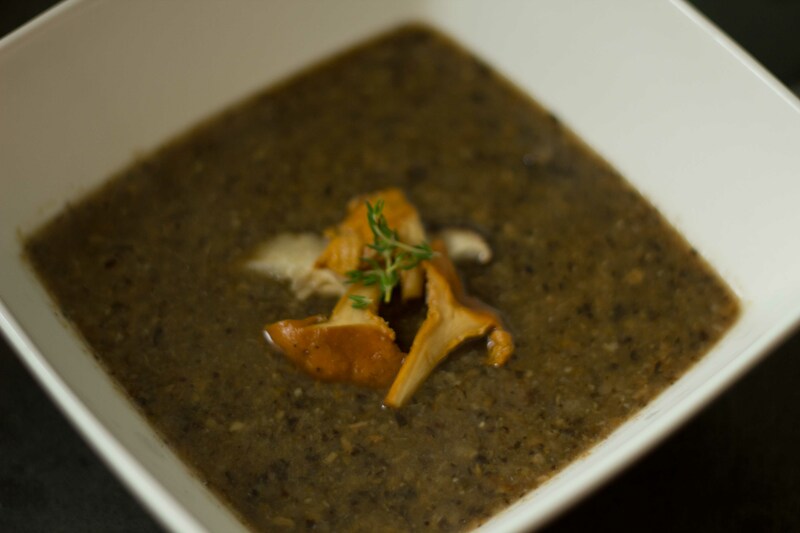 I would love to try the luxurious recipes I see for bisques and cream of… soups, because I’m somewhat conscious of creams and fats I don’t allow myself to make them. So I roast and blend and try to create soups as soothing to the soul as Campbell’s can be. I found a Jamie Oliver recipe for mushroom soup that looked like it might give my favourite label a run for its money. It was easy to make, fairly healthy and tasted marvelous. 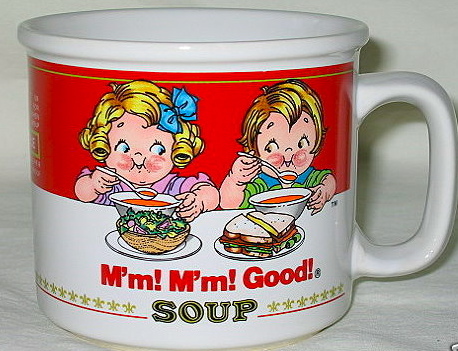 It was Campbell’s soup mug worthy… If only I still had that mug.